While in Texas a few weeks ago we found Texas Longhorn Cattle on two small ranches. Basically these longhorns are kept for weed abatement and for a hobby. In any case they are very pretty. As you can see the ranch owner let us in the field with the cattle. I was pretty nervous at first but they were tame to the point of letting us get close, but would walk away if we got within 15 feet. The Texas Longhorn is a breed of cattle known for its characteristic horns, which can extend to over 6 ft (1.8 m) tip to tip for bulls, and 7 ft (2.1 m) tip to tip for steers and exceptional cows. They are descendants of the first cattle in the New World by Christopher Columbus and the Spanish colonists and have a high drought-stress tolerance. Texas Longhorns are known for their diverse coloring, and can be any color or mix of colors, but dark red and white color mixes are the most dominant. 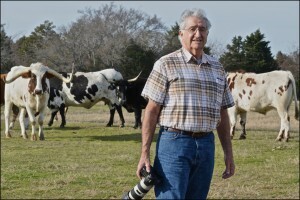 Registries for the breed include the Texas Longhorn Breeders Association of America, founded in 1964 by the Kerr County rancher Charles Schreiner, III; the International Texas Longhorn Association, and the Cattlemen’s Texas Longhorn Registry. Genetic analyses show the Longhorn originated from an Iberian hybrid of two ancient cattle lineages: “taurine” descending from the domestication of the wild aurochs in the Middle East, and “indicine”, descending from the domestication of the aurochs in India, 85% and 15% respectively by proportion. The Texas Longhorns are direct descendants of the first cattle in the New World. The ancestral cattle were first brought over by Christopher Columbus in 1493 to the Caribbean island of Hispaniola. Between 1493 and 1512, Spanish colonists brought additional cattle in subsequent expeditions. The cattle consisted of three different breeds; Barrenda, Retinto and Grande Pieto. Over the next two centuries the Spanish moved the cattle north, arriving in the area that would become Texas near the end of the 17th century. The cattle escaped or were turned loose on the open range, where they remained mostly feral for the next two centuries. Over several generations, descendants of these cattle evolved the high feed- and drought-stress tolerance and other “hardy” characteristics that Longhorns have become known for.